Vietnam has shaken off its association with war and its booming economy has allowed outsiders to visit and enjoy its beautiful scenery, delicious food, culture and, of course, its amazing birds. Vietnam has more endemic bird species than any other mainland Southeast Asian country and is the best place to see a large number of regional specialities. This short tour concentrates on Southern Vietnam and takes us to all of the premier birding sites in the area at a time of year when birds are starting to breed and should be more detectable than at other times. By visiting lowland broad-leaved forest, grasslands, wetland, pine woodland and high altitude semi-deciduous forest we will see a wide variety and number of species in a short space of time on this tour. Starting the tour in the capital, Ho Chi Minh City, our birding commences in the forests of Cat Tien National Park where we have an excellent chance of finding two of the star birds in Bar-bellied and Blue-rumped Pittas at this time of year. In this fabulous area of forest we will also search for Germain’s Peacock Pheasant, Orange-breasted Partridge and Siamese Fireback. After spending several days at Cat Tien we will begin our journey northwards to the Dalat plateau where some of Vietnam’s beautiful, but difficult-to-see Laughingthrushes can be found – Orange-breasted, Black-hooded and White-cheeked Laughingthrushes will be high on our target list here. High altitude birding in this area contains an excellent prospect of finding specialities such as Vietnamese Cutia, Yellow-billed Nuthatch, Vietnamese Greenfinch and the stunning Collared Laughingthrush. By spending our time between just a few of the best birding sites we hope to locate a very high proportion of the key birds at an optimal time of the year. Group size: Minimum for tour to go ahead 6 and maximum 10 with 2 leaders. Included in cost: Accommodation in twin rooms en-suite, all meals, bottled water, all local transport, all park entrance fees, and services of leaders. Accommodation: The hotels & lodges used during this tour are of a reasonable to good standard, all with en-suite facilities. 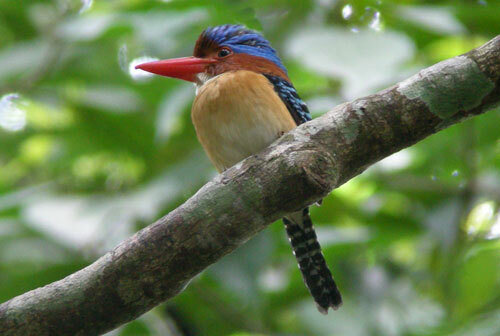 We will stay in the best available lodges/guest houses as close to the birding sites as possible. Tour Code: This is a standard birding tour with regular birding walks along roads and well-marked trails. Expect early starts each day and long days in the field. Expect a few long drives. The weather is generally hot and humid in the lowlands but pleasantly cooler in the mornings at higher altitude. Rain is not a major feature at this time of year, although there could be a shower or two or even some brief late afternoon storms.